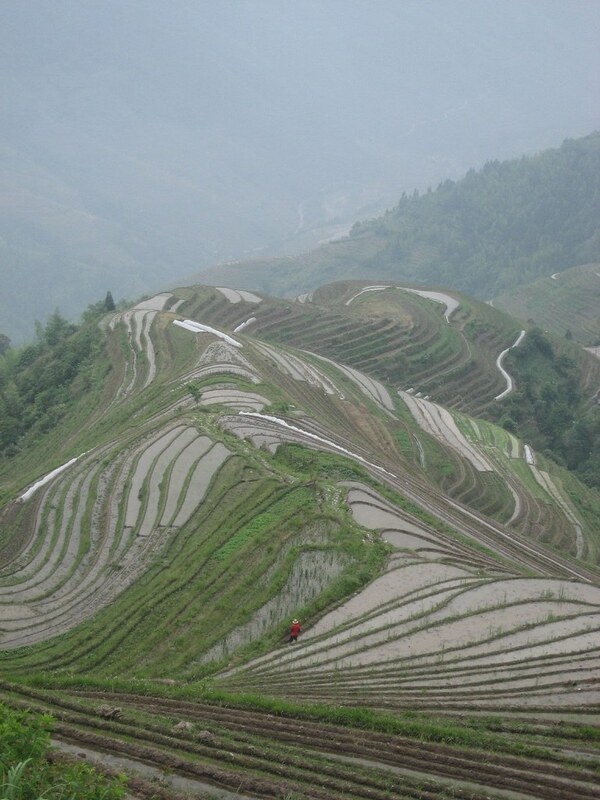 From Yangshou, we headed back north through Guilin again and on to Longsheng – our base for visiting the Longji Rice Terraces, also known as the Dragon’s Backbone Rice Terraces. I’d read a post online from another traveler that Yangshou was really too touristy (true) and that if you really wanted to see the people and countryside, you should head to Longji and the villages within. Once again, if you build it, they will come – in droves. This seems to already be the case with Longji. The good news, like Yangshou, is that with a little effort you can beat the crowds and explore the beautiful country on your own. The terraced rice fields are quite an amazing sight and make for a good day of hiking. The fields wind along the hillsides climbing to a height of 885m. They were first built in the Yuan Dynasty and completed in the Qing dynasty. The locals continue to farm these terraces today. Luckily we made it there before the tour buses (and there were many) so we passed only a handful of other tourists. We did however acquire a gaggle of “long hair” women dressed in their traditional garb. We had seen a program about these women on some travel show about China. There’s a village where all the women have incredibly long hair. We’re talking Crystal Gale long hair, but these women tie it up on their head into a kind of a hair turban. When we reached one of the view points they began to follow us and say, “Long Hair, Brushing, Photo.” Apparently giving them some yuan to brush their hair for you while you take a photo is the thing to do. We passed, but these women were persistent and followed us as we hiked around to another view point. After Dave finally relented, giving them each a yuan and taking their photo (no brushing included), we lost two of them. But two more continued on trying to persuade us (I think) to visit their village with them. Eventually we lost another and were down to one. She was really starting to grow on me, but when we made our descent back to the village, she gave up and went in search of more cooperative tourists. Like every other amazing place in China (at least so far in our travels), you can see the traditional villager co-existing alongside the opportunistic entrepreneur. The village of Ping An is in the center of the terraces, and despite being built on a steep hillside, is rapidly growing into a major tourist hub with hotels, bars, and cafes. I really think the locals should revisit their zoning laws! Yet after just a few minute walk into the terraces, you are passing local farmers bent over tending to their paddies. You have to wonder what they think of the long lines of tourists – both Westerners and Chinese – tramping along their winding flagstone paths to see the various view points. Will the children of these farmers want to continue farming or will they find it easier to serve up a Tsing Tao beer to the tourists who camp out in Ping An for an a “night in the village”? One thing is for sure. Someone will have to keep on farming or there won’t be any tourists I suppose.